St. Sabbas the Sanctified was an instructor of the desert, adornment of monks and luminary of the inhabited earth. He was born at Mutalaska in Cappadocia, in 439 AD. He entered a monastery near Mutalaska at an early age, where he stayed for 10 years. He then went to Jerusalem to learn from the example of the solitaries of that country. He passed the winter in a monastery governed by the holy abbot Elpidius, but his love of silence and retirement made him prefer the manner of life practised by St. Euthymius. Euthymius judged him too young for an absolutely solitary life, and therefore recommended him to his monastery below the hill, about five kilometre distant, which was under the conduct of St. Theoktistus. When Sabbas was 30 years of age he obtained leave from Euthymius to spend five days a week in a remote cave in prayer and manual labour. After the death of Euthymius, Sabbas retired further into the desert towards Jericho, where he spent four years in total isolation. After Sabbas had lived there for some time, many came to him desiring to serve God under his direction. He was at first unwilling, but eventually founded a new lavra (now called the lavra of St. Sabbas). The number of his disciples increased to 150, but no priest served the community, for he thought that no religious man could aspire to that dignity without presumption. This provoked some of the monks to complain to Sallust, Patriarch of Jerusalem. The bishop found their grievances groundless, except that the want of a priest was a trouble in the community. He therefore compelled Sabbas to receive ordination at his hands in 491 AD. The abbot was then 53 years old. The reputation of his sanctity drew people from remote countries to his lavra. In 493 AD the Patriarch of Jerusalem established St. Sabbas as archimandrite. St. Sabbas, like St. Euthymius, left his disciples every year, of more often, and at least passed Lent without being seen by anyone. At this time the Emperor Anastasius was supporting the Eutychian heresy, and banished many Orthodox bishops. 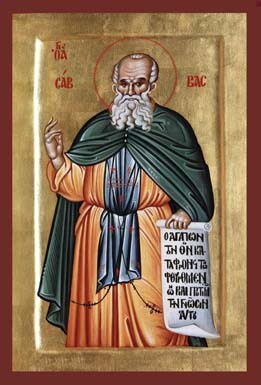 In 511 the Patriarch Elias sent St. Sabbas with other abbots, to endeavour to stop this persecution. Sabbas was 70 years old. He stayed the winter in Constantinople, and often visited the emperor to argue against the heresy, but Anastasius procured the banishment of Patriarch Elias and put one John into his place. St. Sabbas and other monks hastened to Jerusalem and persuaded John at least not to repudiate the Council of Chalcedon. Sabbas is said to have been with the exiled Elias at his death at Aîla on the Red Sea; in the following years he went to Caesarea, Scythopolis and other places, preaching the true faith, and bringing back many to Orthodoxy and right living. In his 91 year, at the request of Patriarch Peter of Jerusalem, St. Sabbas undertook a second journey to Constantinople, in connection with troubles arising out of the Samaritan revolt and its violent repression by the emperor. Justinian received him with honour and offered to endow his monasteries. Sabbas gratefully replied that they did not need such revenues so long as the monks should faithfully serve God, but he begged a remission of taxes in favour of the people in Palestine in consideration of what they suffered on account of the Samaritans; and that he would build a hospital at Jerusalem for pilgrims, and a fortress for the protection of hermits and monks against raiders. Very shortly after his return to his lavra he fell sick, and the Patriarch persuaded him to be taken to a neighbouring church, where the Patriarch served him with his own hands. Finding his last hour approach, Sabbas begged the Patriarch to be returned to his lavra. He appointed his successor, and then lay four days in silence so that he might concern himself with God alone. He died on December 5, 532 AD, at an age of 94. In the life of St. Sabbas the Sanctified there is an interesting story that shows how he inspired his monks to be thrifty and frugal. In the lavra's guest-house there served James the monk. This monk once cooked a large amount of beans, and he threw the leftovers out of the window into a ditch. The Saint saw this from the tower opposite the guest-house. Later, without being seen, he gathered them up. A few days later he invited Fr. James to dinner. When the monk finished eating, the Saint said, "Forgive me, brother, that my cooking did not please you". "On the contrary, Holy Father, I was very pleased. I confess I haven't tasted such delicious and well-cooked food for many years". "So you liked it! Do you know which beans those were?" "The ones you threw into the ditch a few days ago!" The monk felt badly when he heard these words. Ashamed, he pondered the lesson that the Saint had given him. He understood that what belonged to the monastery, whether food or anything else, must be used carefully and economically. St. Sabbas is commemorated on December 5.